LONDON, England (CNN) -- All retired Gurkha soldiers who served in the British Army will be allowed to settle in Britain, the British government announced Thursday, marking a victory for campaigners and a major shift in official policy. 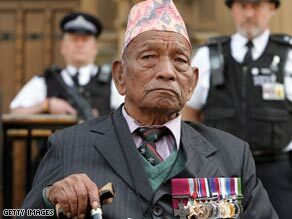 Former Gurkha solider Tulbahadur Pun was awarded Britain's highest honor for bravery, the Victoria Cross. The new rules announced by Home Secretary Jacqui Smith apply to about 36,000 retired Gurkhas who have served more than four years in the U.K. armed forces. Gurkhas will also be allowed to settle in Britain with their spouses and any children younger than 18, she said. Smith said she would instruct the U.K. Border Agency to speed up the processing of their applications. "I'm delighted that we have now been able to agree across government, across the house and with the Gurkhas' representatives new settlement rights that all those who have served us so well so highly deserve," Smith told the Commons. Campaigners listening to Smith's announcement from outside Parliament cheered the news, which comes after years of pushing for greater rights for the Nepalese brigade. Gurkhas are Nepalese soldiers who have been part of the British Army for nearly 200 years. They have fought alongside the British Armed Forces in every conflict in that period, including both world wars, and are known for their ferocity and pride. Despite their centuries of service, Gurkhas were not given the right to settle in the United Kingdom until 2004. And even then the order applied only to those discharged after the British handover of Hong Kong to China in 1997, when the Gurkhas Brigade moved from Hong Kong to Britain. Last month, Prime Minister Gordon Brown announced new rules under which those who retired before 1997 would be allowed to live in the United Kingdom, but Lumley and others complained the rules were too restrictive and would only allow about 4,000 of the soldiers to make the move. Lumley, whose father served in the Gurkhas while she was a girl, said the new criteria could not be met by the average Gurkha. Less than a week after announcing the new rules, however, Brown suffered a stinging defeat in Parliament over the new rules. Even some members of his own Labor Party broke with Brown and voted to give all Gurkhas the equal right to live in Britain. "What could be greater than for us to be able to open our arms and say, 'The Gurkhas are coming!'" Lumley said. "I am a daughter of the regiment and this is a proud day," she said. Lumley, who met with Brown in the morning, before the announcement, said the prime minister assured her there were "no sneaky paragraphs" or fine print in the legislation. The Gurkha brigade originated in the 19th century with Nepalese soldiers, who impressed the British imperial troops with their ferocity and military ability. The first Gurkha units were formed in 1815. They saw action in both world wars and were fundamental to the British military maintaining control of India in the 1800s. Today there are 3,400 troops in the Gurkha brigade, operating from bases in Britain. Most recently, Gurkha troops were used in the Persian Gulf War and the Balkan conflicts.